When you’re out on the open roads of Westchester County, Yonkers and Hartsdale, the BMW X5 is a thrill to be behind the wheel of. With outstanding performance, a sleek interior and numerous tech features, the X5 is a fun car to drive. But there’s a good chance a time will come when a light turns on in your dashboard, and you’ll be searching in your owner’s manual to see what it means. If you don’t have your owner’s manual or just want some more information, this guide to the dashboard symbols is helpful. Also, you may want to schedule a service appointment. Let’s take a look at some of the most important lights in this guide put together by BMW of Westchester. If this light comes on, the letters “ABS” will come with it. This means the stability control system is malfunctioning. The car can still be driven, but be sure to brake earlier. This is something you’ll want to have checked as soon as possible at our service center. If you need to drive in wet or snowy conditions and this light is on, use extra precaution in your X5. The reality of the BMW X5 check engine light is that it can mean many things. If the light is flashing, then the engine or its components might be misfiring. Keep speeds reasonable, and do your best to avoid accelerating quickly from a full stop. If the engine is misfiring, it can damage the emission control system. Be sure to have your car serviced as soon as you can. If the light is flashing, this signifies a more serious issue. The car should be shut down as soon as possible and towed to a professional technician. This light, which looks like an exclamation point surrounded by parentheses, will turn on when tire pressure is low. If the light is red, then tire pressure is very low and air must be added. There may be a rapid leak in at least one of the tires. If the light is yellow, tire pressure may just need a slight adjustment. A drop in temperature can affect tire pressure, so keep that in mind as seasons change. Low tire pressure can decrease fuel economy numbers. Keeping the tires at proper pressure ensures your vehicle is performing at its best. The purpose of coolant is to keep the engine cool. 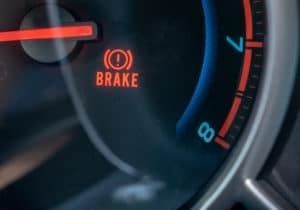 When this light flips on, it means the engine is overheating. There may be an issue with the coolant, but the best thing to do is to pull over as soon as you can and turn the engine off. Don’t open the hood to check anything, as the system could be running very hot. Call our service center instead. The dashboard symbols in your BMW X5 are always worth keeping an eye on. They’re highly informative and meant to be taken seriously. If any of these lights have turned on, contact the service center at BMW of Westchester. It’s always our goal to get you back to driving in Westchester County, Yonkers and Hartsdale as soon as possible.